﻿ DVDFab 4K UHD Solution | World only and complete solution package to 4K Ultra HD Blu-rays. Lost in the World of 4K Ultra HD? No, You Won't! With the movie studios increasingly weighing more on 4K title releases nowadays, it's safe to assume that 4K Ultra HD Blu-rays are going to take over the living room of every household in the near future. However, if you are just about to follow the trend and are getting lost in the ocean of the 4K world as a beginner, then you just come to the right place. Next, we will guide you through all the details. What is the 4K Ultra HD Blu-ray? 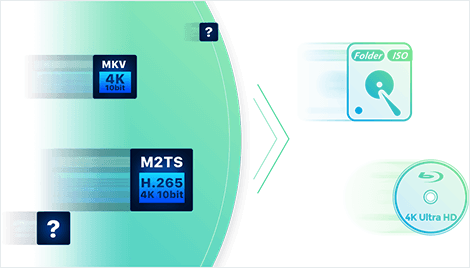 4K Ultra HD Blu-rays, as the name suggest, support 4K Ultra HD (3840 × 2160p) videos encoded using the High Efficiency Video Coding (HEVC) standard (also known as H.265) and at frame rates up to 60 frames per second. In terms of pixel, that's approximately 8.3 million, four times what you get in Full HD (1920 × 1080p). By cramming such a giant volume of pixels into the same sized TV screens, the image becomes sharper and clearer. In terms of size, the discs themselves can be produced in three sizes: 50GB with support for an 82Mbit/s data rate, 66GB with 108Mbit/s and 100GB with 128Mbit/s. However, the charisma of a 4K Ultra HD Blu-ray is not just about the sharpness of its images. 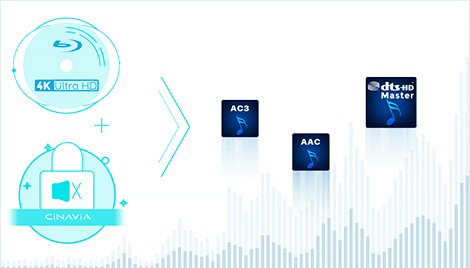 It also employs the industries' newest breakthroughs, including the High Dynamic Range (HDR) and the next-gen object-based immersive soundtracks, such as Dolby Atmos. HDR, as designed, delivers a wider range of natural color, brightness, saturation and contrast, which in theory, takes the picture a lot closer to what human eyes can perceive. 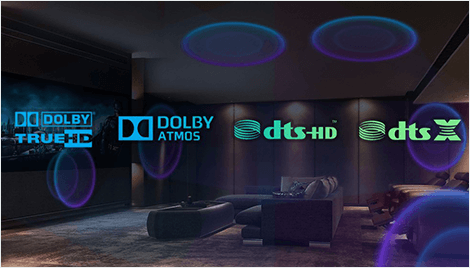 Dolby Atmos, on the other hand, essentially upgrades the sound effects with more subtlety and location precision. Where to Get the 4K Ultra HD Blu-ray Movies? Undoubtedly, buying or renting online is still the easiest way to get your hands on the recent blockbusters available on 4K Ultra HD Blu-rays. And there are many choices out there. Major e-commerce websites like Amazon and Best Buy, together with hundreds of others, offer amazing deals all the year round, sometimes with great discounts during holiday seasons. If you are not a collector kind of person, renting your favorite movies from popular rental services, such as RedBox, Rent4K and familyVideo, might be a better way for you. If purchasing online is not really your kind of thing, it is absolutely okay. Maybe you can visit a nearby movie shop or supermart like Walmart to buy or rent the movies or TV shows you want. The advantage of doing this way is that, if the disc you received is problematic, then you can get it returned and replaced quickly. Do remember to keep the receipt, though. However, the shortcoming is also obvious. 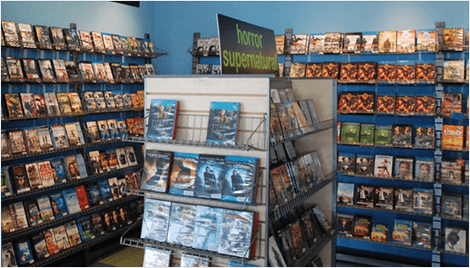 The local store you usually go might not have the movies or TV shows you are looking for, especially when it comes to 4K Blu-rays. In addition to buying or renting a movie from a website or a local store, there is a 3rd method you can try — make your own 4K Blu-ray movies at home, with a 4K UHD authoring software. 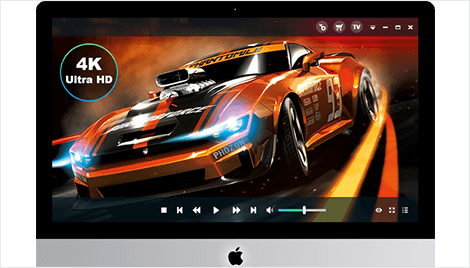 DVDFab UHD Creator is the world's 1st consumer-level 4K UHD authoring software for users to make premium 4K Blu-rays at home, with their personal videos of all formats. The produced 4K Ultra HD Blu-rays technically conform to industry standard. That's to say, they should be able to play back hassle-free on any standalone home 4K UHD Players. How to Watch the 4K Ultra HD Blu-ray Movies? Now that I got my favorite movies and TV Shows on 4K Blu-rays, how do I watch them? 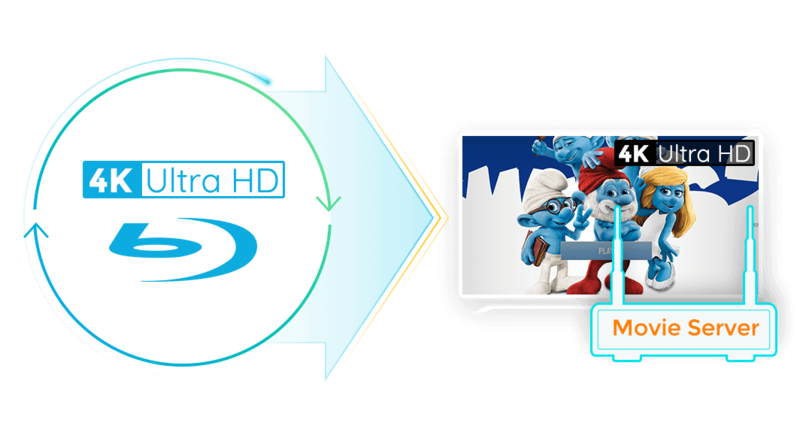 To answer this question, you first need to decide where you want to watch the 4K Ultra HD Blu-rays. The most agreed approach is, of course, still the traditional way – via a 4K UHD Disc Player. However, 4K UHD Disc Players are way more costly than regular Blu-ray Disc Players, not everyone would like to make the upgrade. Luckily, there are some alternatives to the 4K UHD Disc Player — the Android set-top boxes that not only play 4K UHD Blu-ray ISO files and folders, when hooked up with an external 4K UHD Drive, can also play back 4K Blu-ray discs. Some of these STBs are way less expensive than the traditional 4K UHD Disc Players, among which, DVDFab Movie Server is a fine example. DVDFab Movie Server is an all-in-one multimedia playback and management center featuring native menu support on DVDs, Blu-rays and 4K Ultra HD Blu-rays, the exclusive Poster Wall, lossless audio output, smart media library sorting and managing, and tons of other stunning capacities (the feature to play back physical discs from an external optical drive is already on the to-do list). That said, if you are not really into an Android set-top box kind of thing. It's okay, we still have other approaches out there. Next, let's go over the scenarios we can think of one by one. Usually, people who have an HTPC at home will very likely have a giant-screen display dedicated to that HTPC. In today's standard, that huge display device is most likely a 4K UHD TV. An HTPC usually does not have an optical drive. However, it can directly play back 4K Blu-ray ISO files or folders, with a 4K UHD player software, such as DVDFab Player 5 (Ultra). If you do want to watch a physical 4K Blu-ray disc, then you will need an external 4K UHD Drive hooked up to your HTPC. It's easy to find relevant models on Amazon made by major brands, such as LG. It's already no secret that nowadays, desktops and even laptops are coming up with 4K or better screens. If you've just grabbed one of these monsters, then you can watch 4K Blu-rays there. Unlike an HTPC that usually has a smaller size, a desktop or laptop has more space for an optical drive. If yours comes with a 4K UHD Drive, then you are lucky; if not, find an external one on Amazon. 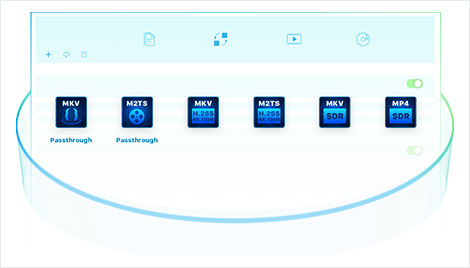 However, if you already have the ISO files or folders of the 4K Blu-rays saved on your hard drives, then the only thing you still in need, similar to on an HTPC, is a 4K UHD player software, such as DVDFab Player 5 (Ultra). In spite of being increasingly popular, not everyone is ready to jump from regular Blu-rays to 4K Blu-rays. After all, 4K Blu-rays and everything related to them are not money-friendly, as least for now. Therefore, what if someone sends you a 4K Blu-ray disc as a birthday or holiday gift, but you don't have a 4K TV, nor a 4K UHD Player to watch it on? There is no need to worry about that. You can choose to downscale and convert the 4K Blu-ray to standard Blu-ray specification to watch on a non-4K Blu-ray player or HDTV. DVDFab UHD to Blu-ray Converter is particularly designed for this circumstance. Sidenotes: In consideration of the HDR contents that 4K Ultra Blu-rays offer, it's better that your 4K UHD TV is HDR capable; Ideally, you'd also have a receiver that supports object-based audios, Dolby Atmos and DTS:X. Though it's not a must-have, it does make the audio experience way more astounding. 4K Blu-rays Are Pricey, How to Keep Them Safe? 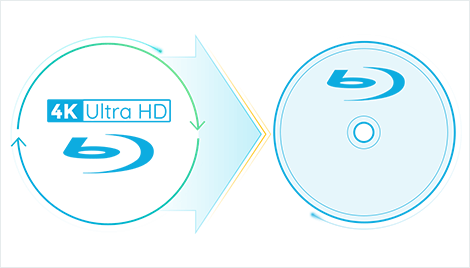 4K Ultra HD Blu-ray movie disc can each store around 70GB of data, but similar to DVDs and Blu-rays, these discs have a tendency to get lost or damaged over time. When either of these tragic events happens, the data on the disc becomes unusable or impossible to recover. Therefore, making backup copies is what people usually do to keep their precious DVDs, Blu-rays and 4K Blu-rays safe from being damaged. It's true that 4K Blu-rays are still not budget-friendly as of now. Plus the fact that any physical disc wears out after being played for many times, or mishandled. Therefore, to preserve and keep them safe becomes a real headache, until the introduction of the 4K UHD copy software products, such as DVDFab UHD Copy. DVDFab UHD Copy can copy the main movie title or the entire disc of a 4K Ultra HD Blu-ray movie off the original disc, and then save the content as a 1:1 lossless or compressed ISO file, or burn the compressed content to blank BD50/25 discs. In the process, both the Dolby Vision and the HDR10 video quality can be preserved. Compared to making physical hard copies, ISO files or folders, converting a 4K Blu-ray to a single on-demand digital video can not only save you huge money on blank medium, but also your rising investment on 4K streaming services from Netflix, Amazon, Apple and the likes. With the help of DVDFab UHD Ripper, you can do that in a few mouse clicks. DVDFab UHD Ripper, possibly the best 4K Ultra Blu-ray ripper software out there, can convert a 4K Ultra HD Blu-ray movie into MKV/M2TS formats, with lossless or 4K HEVC 10-bit video quality. 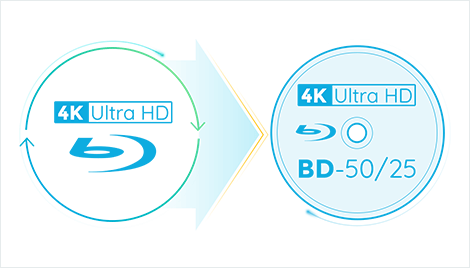 This means, after putting the discs on shelf, you can still enjoy your favorite 4K Blu-rays on your 4K UHD TV. When copying or converting 4K Blu-rays, it is inevitable that you will come across the notorious Cinavia watermark. It is employed to prevent you from making backups, even for home purposes. For such a long period, it is tagged as unbeatable, but not anymore, with the introduction of DVDFab UHD Cinavia Removal, the 1st of its kind in the entire world. It can help remove the notorious Cinavia watermarks planted in the audio tracks of most 4K Bu-rays, producing the lossless Cinavia-free backups or on-demand digital videos that shall never mute in the middle of the playback process, not even when the 4K Blu-ray playback device installed with a Cinavia detector performs a firmware update in the future. 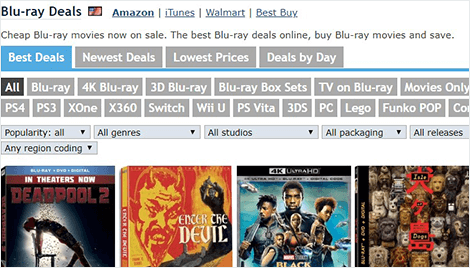 Sidenotes: As of now, DVDFab already supports most of the 4K Blu-rays, and the number is still growing on a daily basis. And among those supported titles, some are Cinavia-infected, you can Check the List anytime. What's more, to make sure DVDFab can work as expected, it is highly advised that you also check out our Supported UHD Drive List. One more thing to keep in mind: DVDFab does not support rented discs, and do not use our products for any commercial purposes. Interested in the Above-Mentioned UHD Products? Evolution never stops in nature, nor does it in the media storage sector. As Blu-rays gradually edges out DVDs in old days, it is just a matter of time for the 4K Ultra HD Blu-rays to do the same to regular Blu-rays. Therefore, if you are ready to move forward to jump on the boat of 4K realm, we would be very glad to help you in that process! In this regard, we are offering 30% OFF on all of our 4K UHD relevant software products mentioned above! Check out our Online Store and don't forget to apply the coupon code UHDTROFF when checking out.